Liverpool defeated Man United 3-1 on Sunday to retain top spot in the Premier League. 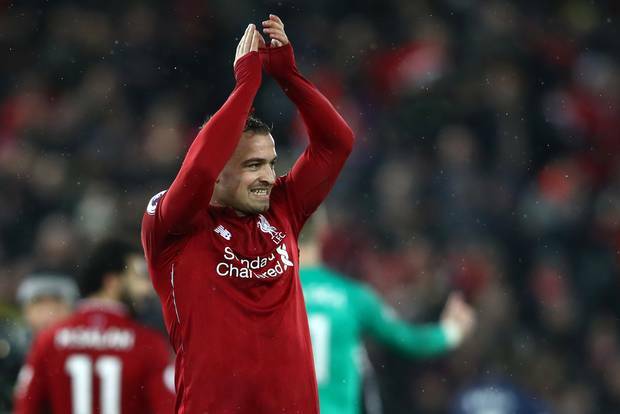 Two second half goals from substitute Xherdan Shaqiri won the game for the Reds after Jese Lingard had cancelled out Sadio Mane’s opener in the first half. On Saturday, Man City powered their way onto a 3-1 win over Everton. Gabriel Jesus scored a double for the Citizens while substitute Raheem Stirling rounded off the scoring after Calvert Lewin had initially halved City’s lead. For Chelsea, they defeated Brighton 2-1 away from home on Sunday with Pedro Rodriguez and Edin Hazard getting their names on the score-sheet before Solomon March pulled one back for the hosts. In Hampshire, Arsenal were subjected to a first loss in 23 competitive games as Southampton won a five goal thriller 3-2 at the St. Mary’s. Former Liverpool striker, Danny Ings helped himself to a brace, setting the tone for Charlie Austin to win the game for Ralph Hussenhuttl’s side with five minutes to play after Arsenal had pulled level twice through Henrikh Mkhitaryan’s brace. For Tottenham Hotspurs, they required a Christian Eriksen injury time winner to dispatch Burnely 1-0 on Saturday. Elsewhere, Wolves, WestHam, Newcastle, Watford and Crystal Palace were all victorious in their respective fixtures while Fulham remained bottom of the log thanks to a third loss in their last three games. GK. Vicente Guaita (Crystal Palace). He may have made only two saves in Palace’s win over Leicester on Saturday but the one against Vardy was at good as they get. Guaita who was only making his debut in the League was unbeatable on the day and will get the node in between the sticks in my team. Newcastle Captain, Lascelles made nine clearances, two interceptions and one block to help preserve his side’s 1-0 victory over Huddersfield Town on Saturday. CB. Fabian Balbuena (West Ham). Others got the goals but it was Balbuena who shut out Fulham as West Ham defeated their fellow Londoners 2-0 on Saturday. He keeps on impressing me and is without a doubt one of my signings of the season so far. No Liverpool player created more chances against Manchester United than Andy Robertson. Despite being a full-back, i will slot the Scot into my three-man defence. Had the his best game in a Liverpool shirt eversince moving from Monaco in the summer, dominating the midfield and setting up Mane for the opener. Quina scored Watford’s third in a 3-2 win over Cardiff, while he also completed 89% of his passes in the game. MF. Leroy Sane (Man City). Sane looks to have put his miserable start to the campaign in the back-pack and continues to impress of late. The German up Gabrial Jesus for both of the striker’s opening two goals. Came off the bench late on but had a significant impact on the game, scoring twice as Liverpool dispatched arch-rivals Man United 3-1 on Sunday. What a signing he is proving to be. No Chelsea player had more shots (2) or created more chances (3) than Hazard against Brighton. Hazard went on to score what proved to be the winner in the 2-1 victory. ST. Gabriel Jesus (Man City). The Brazilian striker scored a brace from just two total shots in the game against Everton on Saturday. What a way to announce yourself to the new manager. Ings scored a brace on his return from injury in Ralph Hussenhuttl’s second game in-charge.